Peter Brendan Duffy, long time member of the Monaghan Pipe Band, has announced his retirment. Pete first joined the band in 1960. He is a native of Clontibret, County Monaghan. His career with the band spans five decades. Each of his three children have played with the band. For decades, no name has been more synonymous with the Monaghan Pipe Band as that of Pete Duffy. He has always done Yeoman's work in keeping the band going, doing anything and everything necessary to keep his band strong. All this, and years of playing and miles of marching. A Few Memories; Beginning in 1977, Peter Duffy assisted in raising a drum corps for the band by driving students to Greg McLaughlin's for lessons. He then opened up his home for these lessons to continue. Pete Duffy led the band's operations to bring Monaghan to Ireland in 1979. He was part of Monaghan's Grade Five Unit in 1997 when they won EUSPBA Champion Supreme Honors. Peter was interviewed on CBS'This Morning on St. Patrick's Day 1998 following a Monaghan Pipe Band network performance. Peter was an unwilling star in the video "Jump Around" by The House of Pain. Look carefully at this video and you will see one cut (which was used several times) of Peter Duffy marching up Fifth Avenue with the Monaghan Pipe Band. What many band members will always be grateful for is Pete's culinary skills which were demonstrated at contest after contest. Young Peter Brendan Duffy (right) in Ireland with his sisters Kathleen (left) and Angela (center). 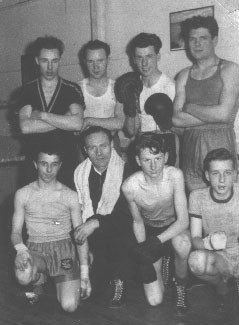 Pete (back row, far right) spent some time in England as a light weight boxer. Peter Duffy (left) embarks for the States as his brother Gerry accompanies him to the docks. Practicing his pipes at home in 1960. Peter has worn many uniforms over the years but has never belonged to any band other then Monaghan. A piece of Monaghan in New York City. Pete Duffy (right) in the late 1970s wearing Monaghan's full military uniform of the time, including the McKenzie Kilt. 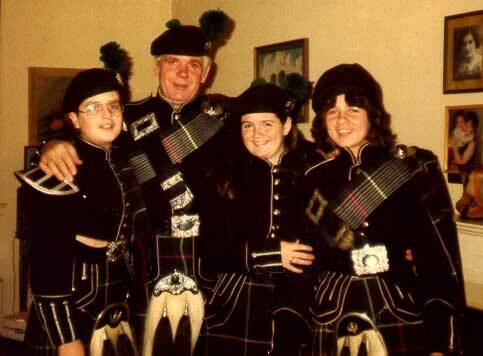 1979 - Pete Duffy with his son/snare drummer Martin (left at age 12), daughter/bass and tenor drummer Linda (3rd from left at age 15), and daughter/piper Annette (right at age 14). Pete played with this 1997 Grade Five Unit which won EUSPBA Champion Supreme Honors. Always the host, Pete cooked for the band at almost every contest for the last ten years.